THANK YOU to everyone who entered my recent giveaway for Craftsy's Beginner Serging class with Amy Alan. 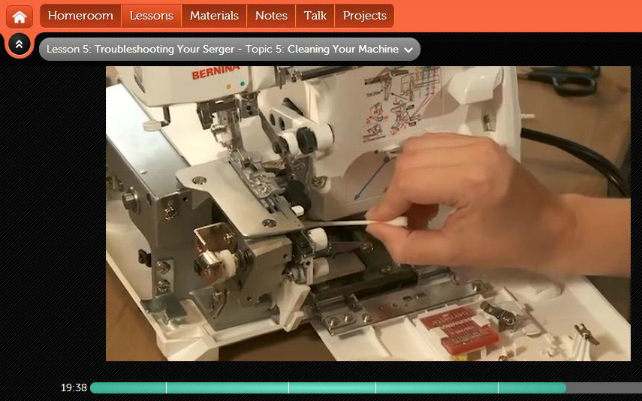 I'm thrilled to see that so many of you have a similar goal to learn more about your serger. We should all be best buds with our machines. Yay Elizabeth! Sounds like you'll put the class to good use. I have e-mailed you the link to your free class. But, friends, don't fret. Craftsy and Amy have also offered to share a link with all my readers for a 50% DISCOUNT on the Beginner Serging class. Yep, fifty percent. Just click HERE to get your class half-off. The best part is, it doesn't expire. So even if you don't have a serger right now but are looking into it, you can use this discount link later. How's that for a deal, huh. Let me know if you take the class; I'd love to hear what you think. Thank you Craftsy and Amy for making this class more widely available for all of us. I sound all salesy, but I'm just happy to share these opportunities with you wonderful folks. Have a great weekend, everybody. Count 'em. 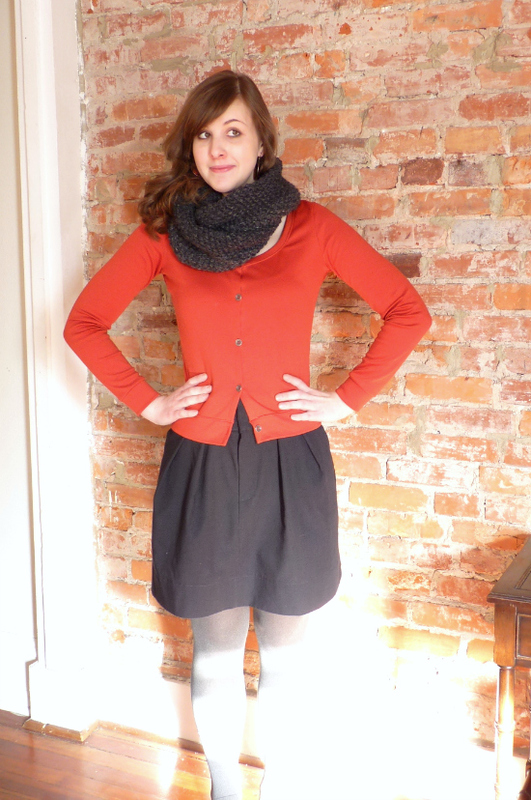 My outfit today consists of three handmade items, a rare feat for me. Three -- how can it be? Renfrew cardigan, check. We've seen that one. Black skirt? Yeah, looks home-sewn for sure (more on that later). But what else? Did I sew my own tights? Ick, no. I knitted my first ever scarf. My first ever anything! Boom. This is the same project I started when I was home for Christmas without my sewing machine and with a whole lot of time. I saw the GAP-tastic Cowl (free Ravelry pattern) that Kelli made, and decided to go for it myself. It's just a seed stitch, knitted in the round, but I had to completely start over four or five times because I didn't know how to fix my mistakes without doing so. I very nearly surrendered to it, but I saw a friend wearing the exact store-bought GAP cowl that this pattern is based on. 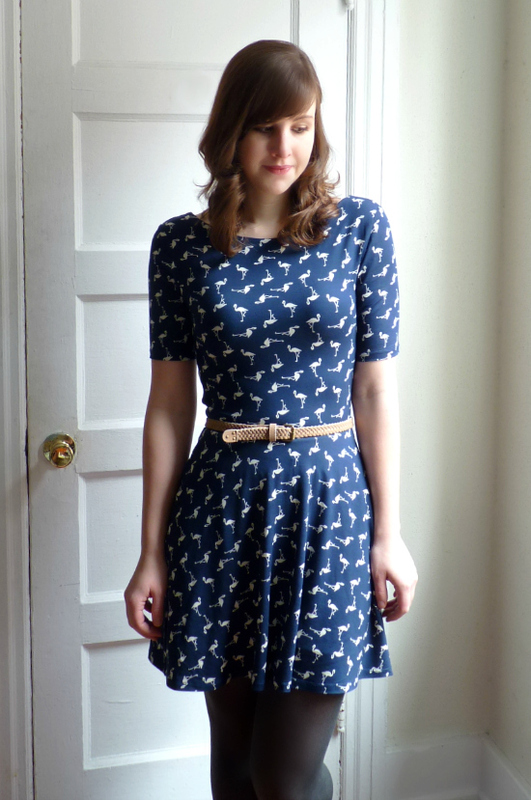 Just like with my sewing, I wanted to prove that I could make my own, in the USA and with my own little lobster claws. Take that, GAP. 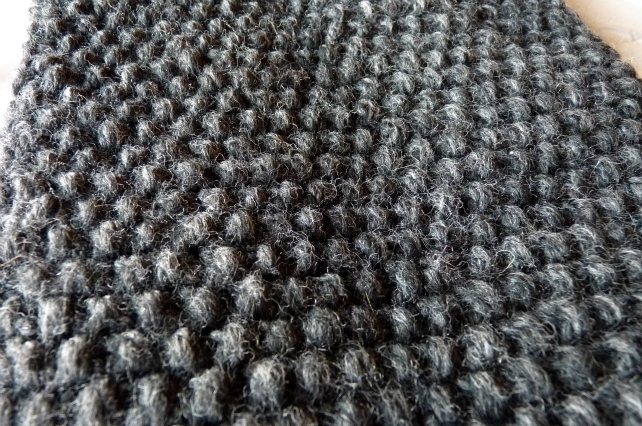 The yarn is Lion Brand Wool-Ease Thick & Quick in charcoal, which you can find anywhere. I know this because I ran out of yarn halfway through binding off (hey, genius) and found some more on Fabric.com. I will talk about the skirt, too, because we're all here for the sewing, yes? And I like it! It's another first: my first PDF pattern. I finally got a printer so it's opened up the world of Burdastyle online patterns to me, which means I can now enjoy even more curse-inducing sewing-related headaches, I guess. Just as they (you) say, Burda PDF instructions are basically worthless. 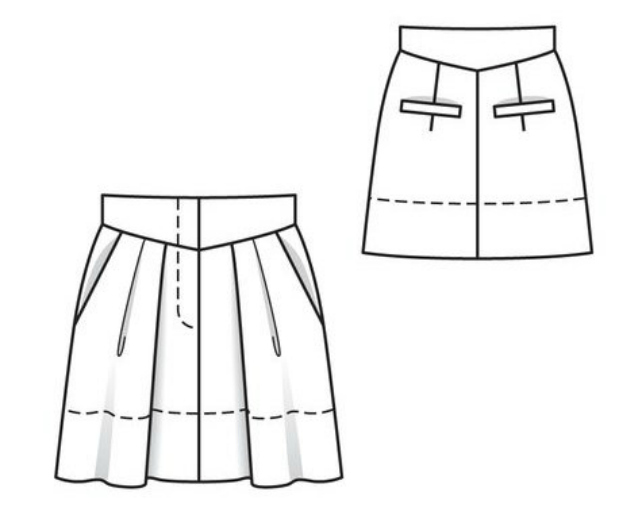 When it comes to skirt-making, though, I can make educated guesses. Not sure I could tackle a tailored coat with them just yet. This is the Burdastyle Mini Pleated Skirt 05/2012. I've been wanting a zip-fly skirt for awhile; I like the casual look of it and already have far too many button-up skirts. The Grainline Moss mini skirt is pretty darn cute, but it sits lower and fits straighter and tighter than I typically like. This Burda one popped up on Sophie (Cirque du Bebe)'s Pinterest, and I decided it would be a good start to my PDF pattern adventures. It's only 15 pages total. 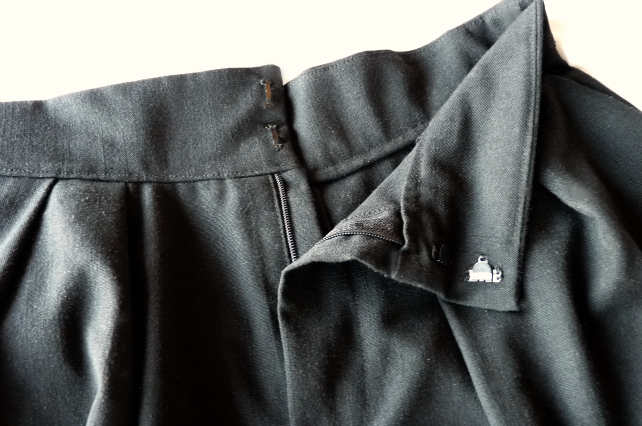 The Burda instructions did not show illustrations for any of the steps, so I needed some help with the fly zip. I consulted a tutorial I've had bookmarked for awhile: Debbie Cook's tutorial for a jeans fly, from the year 2001. WHAT? Sewing blogs existed in 2001? In 2001, I think I spent the majority of my time dancing maniacally to 'NSync CDs in my bedroom. I had the "Bye Bye Bye" dance memorized. And what's your greatest accomplishment? Anyway, I've looked at a lot of fly-front tutorials, and have even done one myself (on my Thurlows, after a struggle), but somehow Debbie's made the most sense just reading it before even trying it. It was very straightforward and even easy... but since it was for a jeans fly, my fly ended up opening to the right even though I guess most non-jeans zipper are supposed to open from the left? Meh. The fabric is a boring black linen blend from JoAnn. The only other black skirt I own is a thin elastic-waist jersey thing I chopped from a dress. I wanted something structured that could be tucked into if need be, so my new Burda mini baby was born. Who knows what's going on with this skirt angling. Call it my sassy bell-swing hip pose. Now, don't be fooled. I'm not going to get any closer because the back "welt pockets" are not welt pockets at all! This is the second time in two weeks I've come across this same weird faux-welt construction -- the first one was on a Simplicity Amazing Fit pants pattern, which surprised me. It's just a folded rectangle sewn on the back of the garment then pressed up and stitched at the ends. Normally I don't protest faux-anything because I'm pretty lazy, but this technique is queen of the lazy. Queen E-lazy-beth. I'm sure there's a better way to make easy faux-welts that still look halfway-functional. Right? I'll save it for a less lazy day. Despite how utterly sick I am of winter, I'm feeling pretty good about these new monochromatic additions to my wardrobe, both of which I've already worn a few times. I like keeping it diverse around here: mixing in the neutral basics with the flamingo dresses, you know. What are your recent crafty "firsts"? P.S. OK kiddos, don't forget to enter my GIVEAWAY for the Beginner Serging Craftsy class, if you're into that. You have until Thursday! I'm rooting for each one of you. One of my stated sewing-related goals for 2013 was to learn more about how to use my serger properly. I received my Brother 1034D as a Christmas gift in December 2011 (thanks, Ma & Pa), so I've owned it for a decent length of time and use it on all my projects. I've done some studying, but even after all this time I haven't felt like I knew exactly what I was doing. I didn't really understand what I was looking for to determine proper tension, or which way to turn the dials when things looked obviously wonky. I KNOW, RIGHT. 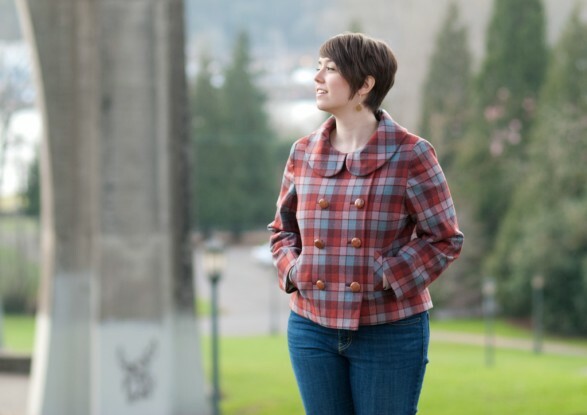 And she did a mini series on cutting & matching plaids, which is invaluable info for us all. The stars aligned and Amy reached out to me not long after (I guess she discovered my blog around the time I discovered hers, coinky dink), and she asked if I'd take her Beginner Serging course and review it on my blog. Girl, you had me at "Hello." I will start by saying I really liked this class. My main goal for taking this course was to learn about "problem stitches" and how to fix them. That expectation was met, but I came away with a lot more. Even as someone who has used my serger regularly, I was never bored by the course content and I feel like I learned a substantial amount of information about a variety of topics. My more detailed (and 100% honest) review is below. Disclaimer: All screenshot images were taken and posted with the permission of Craftsy. You can also ask questions in the chat box on the right, with photos of the issue you're having (brilliant), and you get an e-mail notice when Amy herself answers them. You can see what other people have asked, too, which can be helpful but is admittedly distracting as the questions continue to scroll up the page. You can hide the chat box, though. I loved the drop-down bar at the top of the video, which tells you the lesson you're on and lets you easily navigate through all segments. Craftsy magically remembered wherever I left off in a particular lesson, so I could even revisit the very first lesson then immediately shoot back to where I was. Seriously, after watching this class I'm so embarrassed now about how little I knew about my serger all this time. 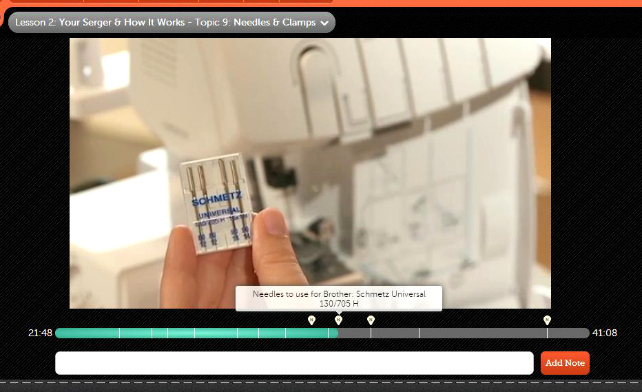 Did you catch my comment above about how I flagged the part where Amy talks about needle type? I DIDN'T EVEN WHAT NEEDLES TO USE. Luckily, my assumption this whole time turned out to be correct. Phew. 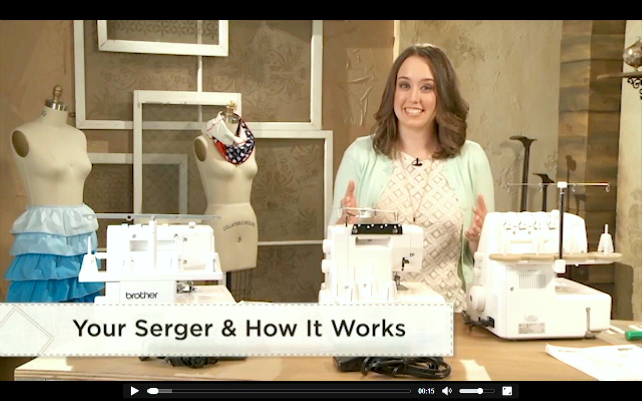 Your Serger & How It Works (machine parts and accessories). 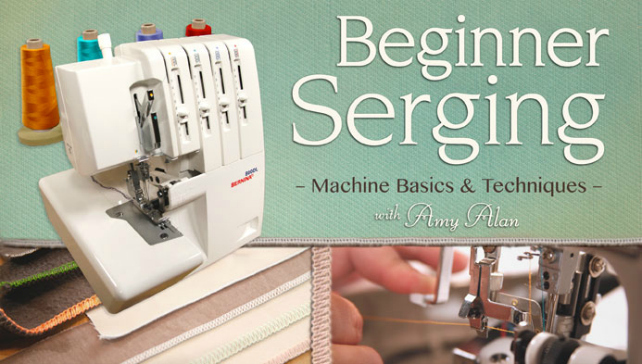 Amy introduces three common models of sergers, including a Bernina, Janome and the ubiquitous Brother 1034D, and compares their basic features and functionality. She uses her Bernina for the rest of the course, but she shared enough info in the beginning that I was comfortable proceeding on my own machine based on what she was doing with hers. Sometimes I had to think twice about which direction to turn my dials to make it do what I wanted, but it's so easy to jump back in time to re-watch Amy's explanations. Or, you know, guess. Basic Stitches - Yeah, I've only ever used the four-thread overlock, but apparently there's a lot more you can do. I honestly don't think I'll use any others for the type of stuff I sew, but I still watched the whole segment for reference in case I do want to do a rolled hem, flatlock, or wrapped overlock one day. Decorative Stitches - This was mostly about decorative types of thread. Did you know you can serge with yarn in your upper looper? Dang that's cute. But again, not really my thing. Projects - This part is fun because you feel like you're actually sewing alongside someone, instead of dragging along alone with your grammatically incorrect Burda instructions or whatever. Amy shows how to make three different projects using only your serger: 1) an exposed zipper bag, a project that practices basic four-stitch overlocking and tying off; 2) a ruffled apron that practices ruffling by adjusting your differential feed and needle tension; and 3) a ribbon-striped scarf that practices flatlocking, serging in the round, and decorative edging (shown below). 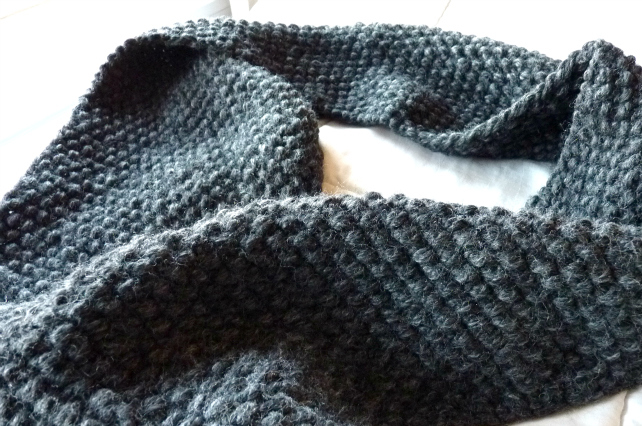 I thought about making the scarf but I'm not crazy about the look of overlocked edges on the outside of my projects. Now, Amy used rayon thread for the edging of her scarf and it's actually quite beautiful. Instead of rushing out to buy rayon thread that I probably would botch up, I decided to use what was already on hand at home and make the exposed zipper bag. Who can resist a boxy bag?! Mine's made of corduroy (Beignet skirt leftover) and the lining is a linen napkin I knew I wouldn't use for napkining. I even had fusible fleece on hand and I have no idea why. Quick and satisfying! And now I can say I've inserted a zipper with my serger. Weird, huh. Amy is incredibly knowledgeable and her teaching style is very clear and organized. She did a good job explaining the basics without dumbing anything down. She's friendly and easy to watch on screen, which is important for the viewer since you're spending hours watching someone talk at you. Sometimes the camera angles on the serger weren't ideal, probably due to studio restrictions and the fact that you'd need to swing around a full 360 degrees to see it all. It seemed difficult for them to zoom in on all those tiny monochromatic parts, and show simultaneously what the serger was doing and what her hands were doing. The example I have in mind is when Amy showed how to remove the thread from the lower looper so you can easily unthread the machine. I couldn't quite catch what she was doing, so I still don't really know how to do it. Despite that, I know that Craftsy quality is 100x clearer than all those wobbly, poorly-lit YouTube how-to-sew videos out there. The only thing I think she could have discussed more was serging with knits, though perhaps that's considered more "advanced" or too specific for the purposes of this class. It seems like one of the reasons people buy sergers is to use it with knit fabric, since the stitches are stretchy by nature. I don't remember the class really talking about that. Amy did talk about the differential feed and the use of ballpoint needles for knits, but a rookie is going to want to serge the heck out of their tissue jersey hems and they're going to be disappointed when they wave out. (Or was that just me, who thought it'd be brilliant to make a cardigan out of the thinnest-weight poorboy rib knit fabric for my FIRST serger project?) While Amy demonstrated using a stabilizer to use when serging delicate fabrics, she didn't talk about using a stabilizer for knits. All in all, I'm very happy with this course and I think it's worth it for any serger newbie (or not-so-newbie, as my case may be) to check out. It's just nice to have all your info in one place, coming from a consistent & trustworthy source, instead of in spotty tutorials spread out over Pinterest, YouTube, internet bookmarks, or your bookshelf. I definitely came away knowing what my stitches should look like, what all the machine parts do, and I have a better understanding of what steps I should take to fix issues and make my seams edges stellar. I even have a cute boxy bag that will hold my sewing supplies when I travel to Sewing Circle on Sundays. So if you made it through my rambling, you may be keen to take this class yourself! Maybe you recently bought or received a serger, or you bought one three years ago and it's still in its box. Maybe you just want your stitch quality to be a little better, or are interested in making the projects she teaches. This class could be perfect for you! Because Amy and Craftsy are SO FREAKING NICE, they have offered to give away a free Beginner Serging class to ONE OF YOU! All you have to do is leave one comment below, stating why you think this class could benefit you. That's it! The giveaway is open until February 21st at midnight EST (a week from today) and I'll announce a winner the next day. Good luck, future serging fiends. Meanwhile, you can ask me any questions you have about the class and I'll be happy to answer. Trick question. We're equally cute. Well, the flamingo may be leggier but at least I have a smaller schnoz. Do you follow Marie's fantastic blog, A Sewing Odyssey? Did you see her flamingo print Renfrew top? Did you let out an embarrassingly shrill squeal when you saw her giveaway for two full meters of that same flamingo print jersey? 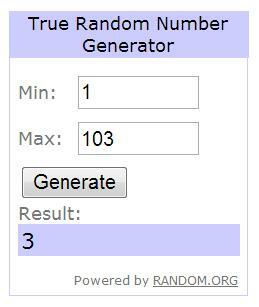 Were you one of the ONEHUNDREDTWENTY people who entered? DID YOU WIN? These little flamingos paddled all the way across the frigid Atlantic Ocean into my outstretched arms. It's some of the softest, drapiest, most adorable jersey you could rub you face on. 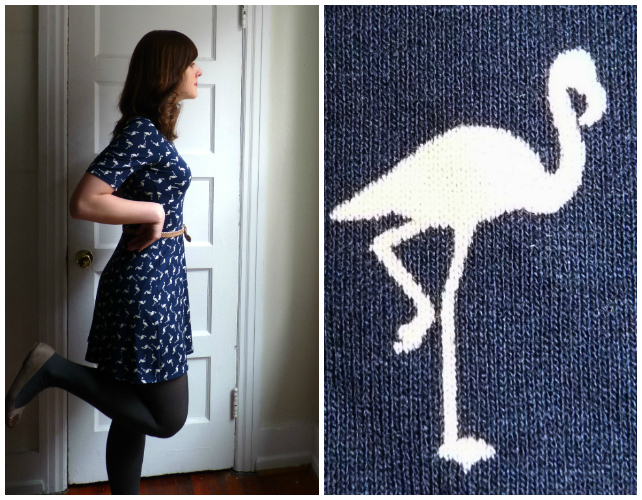 I thought I would wait until it was seasonally appropriate to make and wear something with flamingos all over it. Seasonally appropriate, ha ha. But someone somewhere is always turning 40, right? What's more appropriate is that it's "Sew Grateful Week" as hosted by Debi, and today (Thursday) is the day bloggers are encouraged to post the projects they made with something they won in a giveaway. And because I'm sew grateful for Marie's generosity as well as for all the flamingos of the world, I had to take this fabric off my shelf and make something with it, stat. I really struggled deciding what to make at first (top, dress, wrap cardigan, circle scarf, circle skirt, yoga pants, power suit, onesie, vest, hot shorts, toga, wedding gown, curtains, uh?!). I eventually determined this fabric needed to swing a lil' bit, so I ended up consulting a great source of inspiration for jersey dresses: House of Pinheiro's blog. 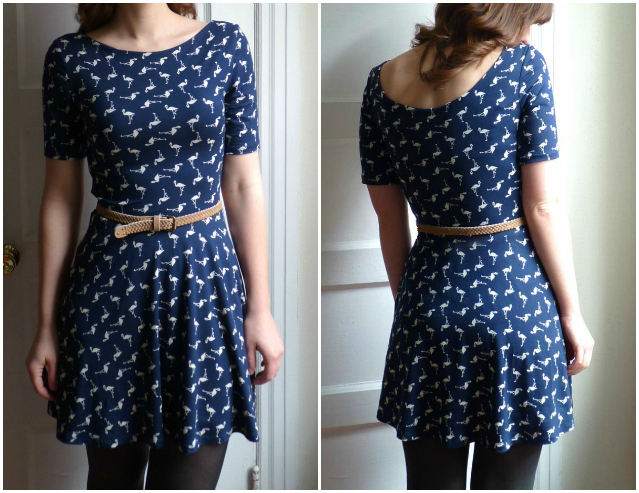 She recently made a dress with a boat neck, scoop back and circle skirt. Flamingos on a boat neck? Perfect combo. I traced a RTW fitted knit top for the bodice, used the Renfrew sleeve pattern (shortened to an in-between length that'll make this wearable in summer, too), and attached a quarter-ish-circle skirt. I didn't want to add a neckband to the boat neck, so I fully lined the bodice with self-fabric, which solved the issue of finishing the neck. Since I know you'll ask, I did not stabilize the waistline. Ehhh I never do. It's just serged. Sorry. I love everything about this dress except the length. I cut it too short, as usual. I have a habit of losing my ruler at the same time I'm feeling overly confident with my rotary cutter. Learn, girl! Awwwwww. 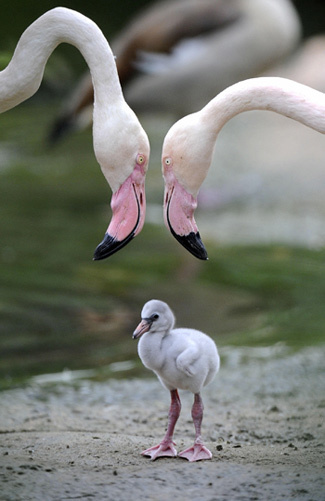 Fun fact: flamingos are white when they're born and grow pink over time due to their diet. The more vibrant, the more well-nourished! -------- P.S. I just switched to a new commenting platform, Disqus, because spam was getting through the Blogger filter at an increasingly rapid rate. I didn't want to use word recaptcha, so I switched platforms entirely. Please let me know if it's confusing or if you hate it. I don't like that it lacks a place for you write your website (if you don't have a Disqus acct already), so I won't mind if you just include a link to your blog somewhere in your comment. I like tracing your roots!